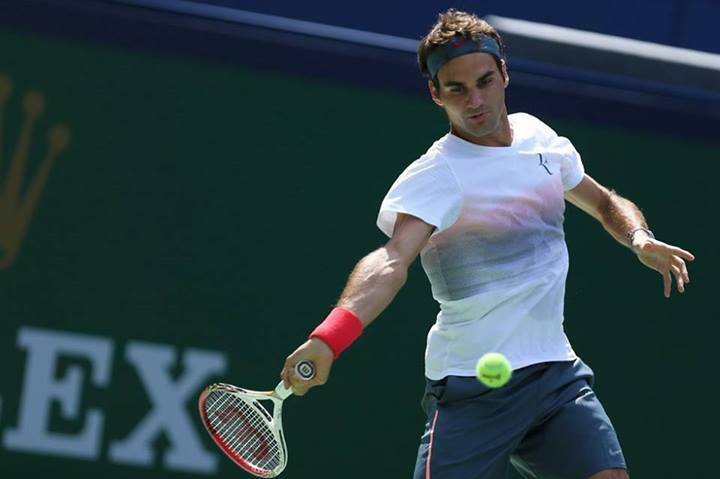 The draw is out for the 2013 Shanghai Rolex masters, and Roger Federer is playing in both singles and doubles draws. Seeded fifth, the Swiss maestro will face either Lleyton Hewitt or Andreas Seppi in his opening second round match. He could face ninth seeded Richard Gasquet or Gael Monfils in the third round, followed by a quarterfinal clash with Novak Djokovic. By seeding, a semifinal match would feature either third seeded David Ferrer or seventh seeded Jo-Wilfried Tsonga. Leading the opposite half of the draw is second seeded Rafael Nadal, fourth seeded Tomas Berdych, and sixth seeded Juan Martin Del Potro. Aiming to qualify for the ATP World Tour Finals in London, Federer will need to reach at least the quarterfinals this week to boost his chances. The Swiss maestro has won the year-end event a record six times. View full draws for both singles and doubles below or download the (singles) printable draw here. In doubles, Federer has teamed up with China’s #1 Ze Zhang, taking a wild card into the draw. The pair will face Kevin Anderson and Dmitry Tursonov in the first round. Awaiting in the second round with a first round bye are fifth seeds Ivan Dodig and Marcelo Melo. 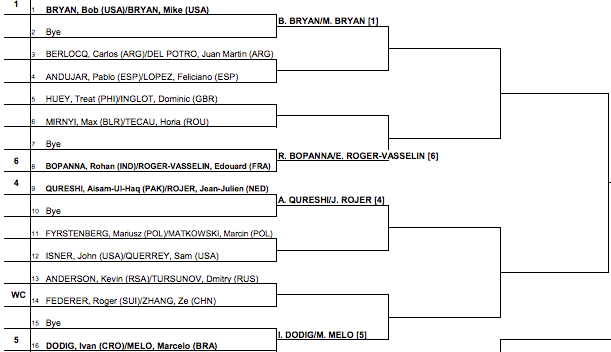 The forward path likely brings match-ups with fourth seeded Qureshi/Rojer in the quarterfinals and the top seeded Bryan brothers in the semifinals. 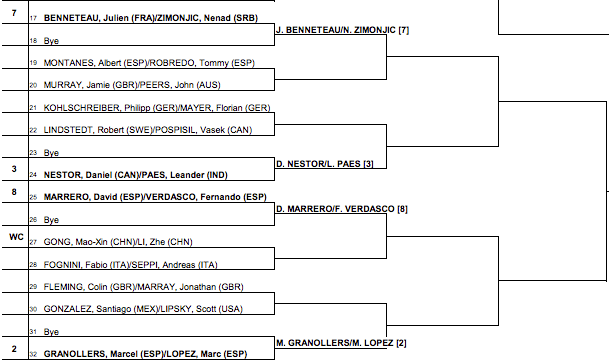 Leading the opposite half of the draw are second seeded Granollers/Lopez and third seeded Nestor/Paes. 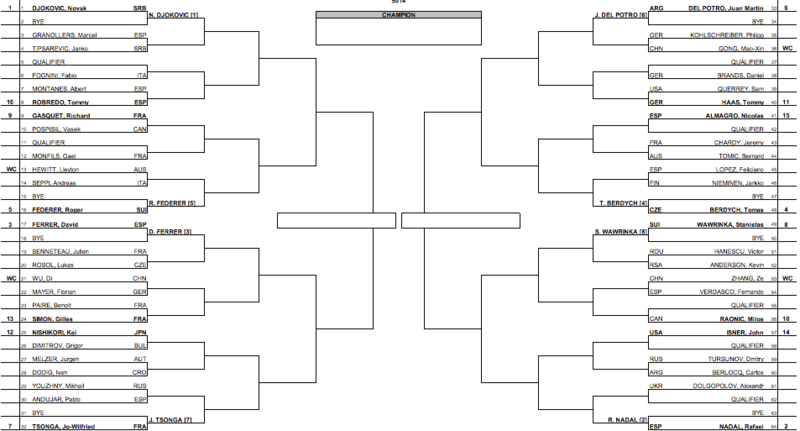 Download the (doubles) printable draw here. Main draw play begins Monday, October 7. See Roger Federer’s Nike outfit here. Watch full coverage of the 2013 Shanghai Rolex masters on FF07tv.